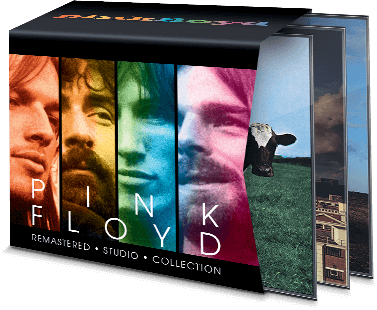 Hot on the heels of Italy, who have just completed the same exercise, stores and news stands in France are just about to start issuing the entirety of Pink Floyd's albums on CD, as well as a double DVD of PULSE, as a part-work collection. We suspect that these will be presented in the same manner as the Italian release - attached to a cardboard backing. If you take out a subscription to the series, so the albums are mailed to you, you will receive one free album, along with a selection of gifts - a couple of t-shirts, a poster (the Back Catalogue image) and a mug featuring Algie. The website advertising this also shows a sleeve to hold all the CDs, but makes no mention if this will be provided to customers. Whilst we suspect most of you will have most, if not all, the band's albums, we know some like these different editions (not least for the retail presentation). If you wish to subscribe, or to find out more information, visit Hachette-Collections.com. Our thanks to Jerome for the information.